When you encounter a black woman that wears her hair natural be it a fro, puff, twists, locs, braids or a curly style - how do you feel about her? 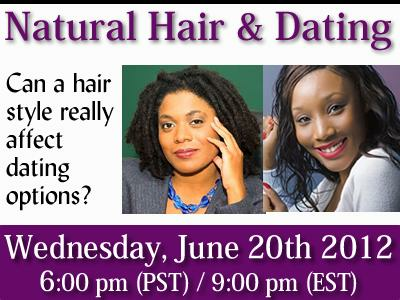 As more and more black women drop weaves, relaxers and flat irons in favor of natural hairstyles, they find that the change in hair is having a great effect on their dating options. That would never date a woman with natural hair. Black women and the dilemma of "what do I do with my hair?" discussed tonight on the Date Smarter Not Harder Relationships Talk Show! The call-in number is 347-327-9215. Please join us beginning at 6:00 p.m. PACIFIC/9:00 p.m. EASTERN.